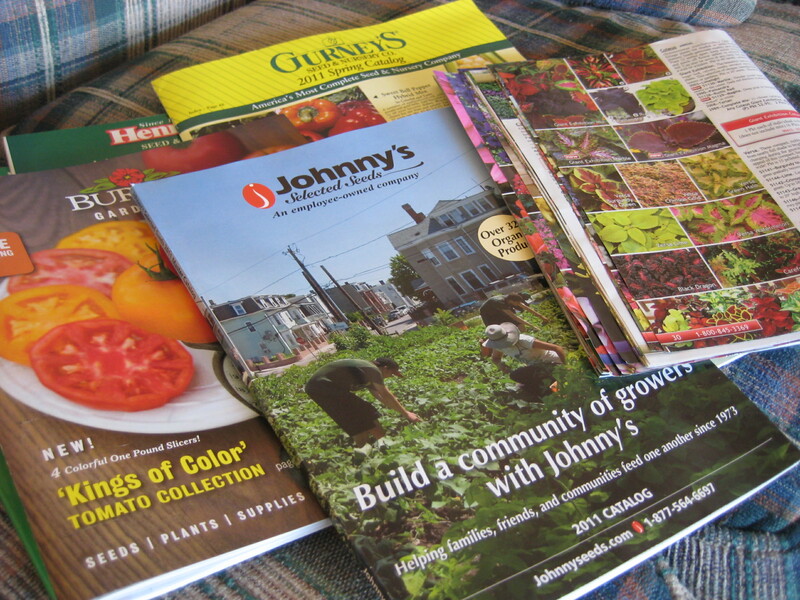 January and February are the perfect time to gaze longingly into a seed catalog and dream of gardening days to come. After all, they don’t show any pictures of weeds in the catalogs, and the veggies are all shown at their peak of summer perfection. It’s easy to imagine how glorious my own garden will be. I also imagine how things will taste. That luscious red tomato? Divine. That perky little leaf of lettuce? Refreshing. Those early spring peas fresh off the vine? So sweet. Then my mind reels with the endless possibilities of how to prepare this rainbow of bounty I’m sure to grow in my fairy tale garden. A head of garlic? Roasted and spread onto a baguette, sprinkled with those happy little herbs in the herb garden. Peppers? Grilled, peeled, thinly sliced and served on a herbed crust with fresh mozzarella. Eggplant? A savory eggplant parmesan in fall, but for summer? Simply sliced and grilled with a brush of olive oil and a sprinkle of salt. Perhaps I’ll put this on my burger bun instead of the meat. Complete it with a juicy tomato slice and life is good. I can almost feel the sunshine on my shoulders as I tend this garden of my imagination. Boy, does it feel good! I gather as many seed catalogs as I can find during the winter season. There is something special in all of them. The quirkier ones are especially fun. The full color ones really take me away. I love reading them almost as much as I love reading cookbooks, but that is another post entirely! By the end of this month I’ll be placing seed orders in preparation for starting the seeds in March. Reality starts to set in when I have to think more practically about how many of each plant to grow, guessing how many might actually germinate and then thrive (always to my surprise) in my indoor growing environment known as the kitchen. It becomes a numbers game and I might suffer gardener’s remorse more than once if something doesn’t work out. But for now, on my couch with the seed catalogs, everything is gorgeous, there are no weeds and the possibilities are as endless as my imagination. This entry was posted in Seeds and tagged gardening, planting, seed catalogs. Bookmark the permalink. Hi Ang! What a great blog! It looks awesome and it makes me long for summer and the beauty of it! Great job! I will check this out often! Thanks Kathy. Thinking about summer gets me through the winter!